Beware HTC's univeral inbox. It may just make your phone unusable. Many users of Android smartphones are familiar with the "Manage Applications" function display, such as the one shown here on an HTC Thunderbolt. It is useful to know how to stop, and clear stored data, from the numerous bloatware apps that wireless operators and handset manufacturers insist on pre-installing in your phone. These applications can consume memory and processor resources, even if you never use them. This can also happen with apps that you have installed yourself, which their developers have designed to start up and run in the background as soon as you turn on your phone. Just go to Settings >> Applications >> Manage Applications, and select the app that you would like to stop or clear. Unfortunately, you may discover that some applications have those critical functions disabled. 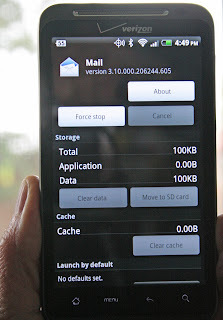 This is depicted here with the gray-shadowed "Clear data" button on HTC's mail application. To make matters worse, HTC doesn't allow users to move the app to to the higher capacity SD card either. Most smartphone manufacturers provide a universal inbox feature like this, so that you can easily access email from multiple accounts and services in the same place. Disabling the clear data function was an especially bad design decision by HTC, since the accumulation of messages and attachments can easily overflow the internal capacity of your phone. If that happens, you may see a symbol with a warning message similar to the one above, though for the internal storage in this case. As it turns out, fixing that problem can be much more difficult that simply deleting email. At least on the Thunderbolt. When our Thunderbolt exhibited this problem, we completely deleted email accounts one-by-one, only to discover that the stored data in HTC's email app stayed the same. We finally had deleted all email accounts, and rebooted the phone, but the problem remained. We spoke with four different advisers on HTC's toll free customer support (866-449-8358 in North America) while troubleshooting this problem. On the first call, after we described the problem, the adviser asked if we used Facebook a lot. Puzzled by that irrelevant question as a starting point, we decided to terminate the call and try again. On each of the next three calls, the first recommendation was to go to the (disabled) Clear Data function. Apparently, even HTC support staff were surprised that this does not work. One of the advisers told us to clear data from the Gmail app. HTC does enable that function, but it was useless since we were using Yahoo and POP mail for some of our accounts. Connecting the phone to a PC through the USB port also did not help, since mounting the device as a Disk Drive only exposes the SD card. The only means of clearing the internal memory from HTC's email app is to do a complete Factory Reset. Having exhausted all other options, short of rooting the Thunderbolt, we prepared to reset the phone. But first, a backup of apps and data was called for. 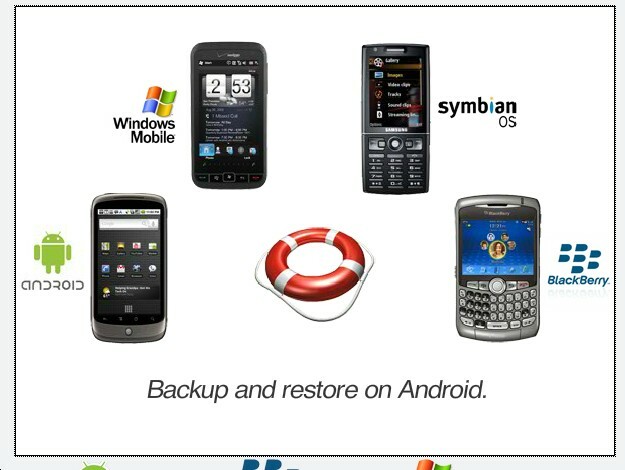 We chose the free version of MyBackup, from RerWare. MyBackup allows users to create a backup of all apps to the SD card, or you can backup online by purchasing the Pro version for $4.99. You can backup data, such as your contacts, bookmarks, and system settings, to either location at no charge. Just to be safe, we also copied the backup of apps on the SD card to our PC, even though HTC says the reset won't affect the external storage. After resetting the phone, we went to the RerWare website through the Android browser to reinstall MyBackup. With that completed, we logged into our account on the site and ran the restore functions. We found that the process was very straightforward, but restoring each of your apps still requires manually going through the individual setup procedures one-by-one. Unfortunately, the backup did not save app data, so we did suffer some loss, such as from our Notepad application. We also encountered some inconsistent behavior, where MyBackup's restore function did not complete the installation of all apps. Placeholders were left on the HTC Thunderbolt's screens, but we had to repeat the restore or go back to Google Play several times to get all the apps we had before the reset. Inconvenient though it is, we recommend not using the HTC Universal inbox because of this problem. Google and Yahoo both provide apps that let you access more than one email account on their services, but you will need a separate app for IMAP or POP email on other domains. If you have rooted your phone, Titanium Backup will let you completely remove bloatware.